It was probably almost two months ago that I heard the request for submissions of our favorite birds and I am finally getting this email off to you. It may be too late for your show, but I still wanted to share my favorite bird. It has taken me several weeks to decide on my favorite bird. There are so many great experiences that have accompanied our birding adventures, but I decided that my favorite bird was one I experienced in my own back yard. It was my husband, Rick, that introduced me to birding. We took a walk along the Mississippi River in St. Cloud when we were first dating in the spring of 1979, and he called a chickadee in within a foot of my head. I was amazed! I had the best viewing of a chickadee ever. Later I came to understand that chickadees are generally “friendly” birds and very cooperative in responding to calls; I even repeated this experience for a bunch of scouts on a camping trip. 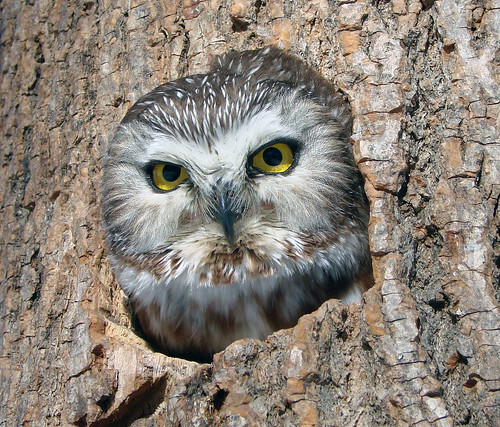 However, it was the calling in of a Northern Saw-whet owl that really wowed me! 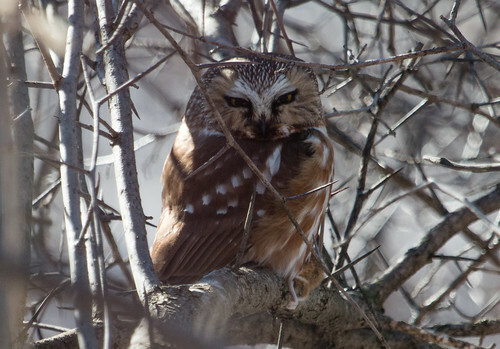 We had been living in the Saginaw area for only a couple years when Rick heard the distinctive too-too-too song of the Saw-whet owl on an early spring evening. I did not recognize the call since this was my first Saw-whet. Rick suggested we take a walk into the woods behind our house and he started answering to the Saw-whet. It was a calm, cool evening and this Saw-whet was interested in having a conversation. It was after sunset and the forest was dark. At first we could tell the owl was moving around us as his response to Rick’s too-too-too song would come from different places. There was excitement in the anticipation to hear from what direction the owl would call next. Finally one call was very close, so we shone a flashlight toward the sound and there was the cutest little owl I had ever seen. I didn’t know that owls even came in that size! 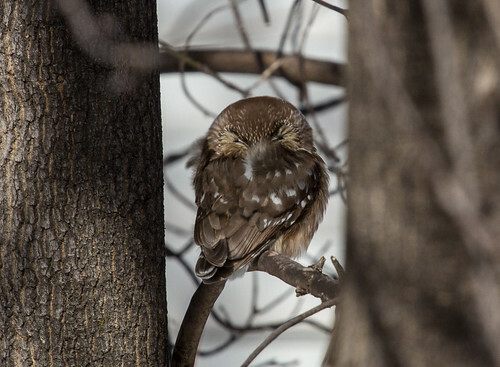 I had grown up hearing and seeing Barred owls on trips to the Boundary waters and then was introduced to the Great Gray Owl and Northern Hawk Owl in the Sax-Zim Bog. Seeing this delightful little owl, who was willing to have a conversation with us in our own back-yard, really made it special and qualifies for my favorite bird. We realized we didn’t have to travel anywhere to have a great birding experience, just be listening and looking for the birds that surround us. It was lovely reading Robyn’s recollections, which stirred up my own memories of Saw-whets calling in the north woods. Some people have called or written me in the past about waking up in the middle of the night in their tent while camping and thinking they were hearing a truck backing up. When they realized what it really was, they were of course charmed—who wouldn’t be charmed by a predator so tiny it barely balances a quarter-ounce hamburger patty and looks fluffy and adorable but feels fierce and powerful, as it is to the insects and rodents that make up its prey. Thanks to flickers and Pileated Woodpeckers, saw-whets have an excellent choice of real estate in Minnesota and Wisconsin forests for both roosting and nesting. The banding station at Hawk Ridge, just above my house, traps, bands, and releases well over a thousand Saw-whets every fall during migration. Some visit my own backyard, too. A few saw-whets overwinter up here—more than once I’ve seen one on Superb Owl Sunday in February, when other people are watching flying pigskins. But the best time of all to enjoy a Saw-whet is when you can hear it as well as see it, during early spring when they’re courting. Robyn’s favorite is pretty darned special by any measure. By the way, there is no deadline to share your favorite bird. You can send me a sound file telling me about it, call the phone number on the sidebar of my blog any day after 2 pm to record it as a message, or send me a note.